It's coming soon. Next week little monsters, literally and figuratively, will be ringing your doorbells and knocking on your doors asking you for candy. That's pretty forward and presumptuous of them when you think about it, isn't it? And they'll hit you with that hallow threat of "trick or treat". I say hallow because if you choose trick I bet they don't have one. They're only in it for the treat. 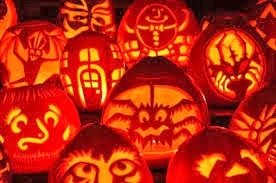 So between now and then I bet you spend somewhere around 40-50 dollars on mini chocolate bars, candy kisses, jujubes, jellybeans and what-have-you so you can dish them out to little kids in costumes carrying a little plastic pumpkin and probably to some bigger kids with no costumes and a pillow case. Yeah, that's right. I've lived in my current neighbourhood for 13 years now and not once has a kid come to my door on halloween. Not one! And every year we still go out and buy a pile of candy on the off-chance someone will come. And who gets to eat it? No wonder I have diabetes. 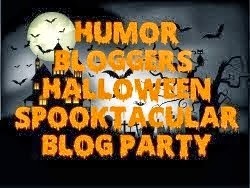 The above post is part of the Humor Bloggers Halloween Spooktacular Blog Party in which I'm participating. It's running from October 21 to November 1. I'll be writing another Halloween post next week but in the interim you can visit Humor Bloggers Dot Com and see what other participants have come up with. Not one?! Well, at least you are prepared. Here's a suggestion --turn your porch light on, sheesh. That could have something to do with it. And no one's egged you? Really, P.J. Do you ask them for a trick? No trick or treaters, huh? Well It's only a 2 hour drive from Montreal, right? Gosh, I thought I was the only one. Last year, the doorbell rang for the first time since we moved in and I was startled. Mostly because I'd already eaten all the candy a week earlier. You don't get any trick or treaters? I guess it's because we live in a complex community - be we get hammered! We have to buy sooooo much candy. Last year was the ONLY year we didn't have Halloween at all - because of Hurricane Sandy. That's when it's a toss up between fruit or money. It goes from trick or treat to banana or a dollar. Since we don't get anybody at the door we usually stay in and get hammered too. Last year was a good one because it was the first semi-normal thing the kids got to do post-Sandy. I love seeing little kids in costume, but I cannot stand teens without costumes (or worse, in half-assed ones -- Jason mask, hockey shirt, etc.) ringing the bell and coercing candy that I should rightfully be saving to eat during my own midnight raids of shame.